Of course, Matthews himself offered a valid reason behind the restrictions, as an attempt to prevent students from voting absentee from the state they live in while also voting in the state they attend school. He brushed this aside by stating only a “weird person” would do so. Neither left-winger decided to mention that in order to get an ID at UNC Chapel Hill, a government issued, valid form of identification is, in fact, required. Nor did they mention that while an address is required on North Carolina Conceal and Carry licenses, they are not present on student ID cards. The idea that requiring an ID to participate in American democracy is discriminatory in a society where an ID is required to drive, buy alcohol, buy cigarettes, obtain a job, and travel by air is utterly ridiculous. Perhaps MSNBC anchors should spend less time spewing rhetoric and more time presenting the facts. 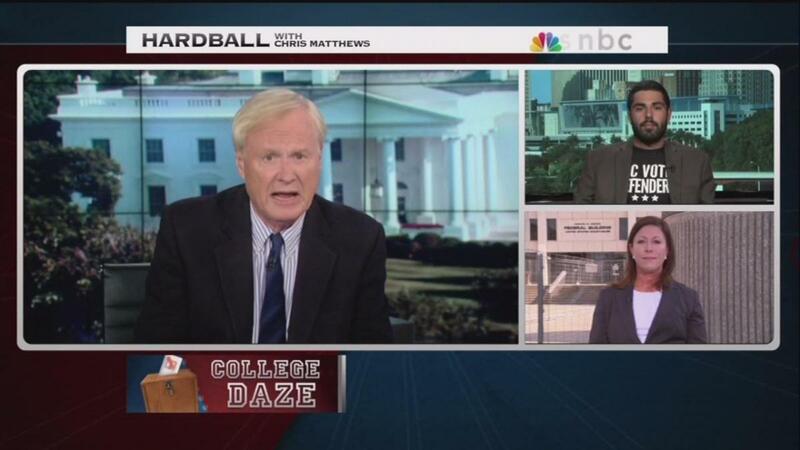 CHRIS MATTHEWS: Welcome back to "Hardball." We’re going to take a look now at the latest frontier in partisan, that means Republican efforts to limit access to the voting booth. The slogan, old enough to fight, old enough to vote became a battle cry in the push the to lower the voting age from 21 to 18. The fact that 18-year-olds were being drafted to fight in the Vietnam War heightened the urgency of lowering the voting age back then. And here you see student protesters here marching with signs that say support the 18-year-old vote. In fact, back in 1970 the push for a constitutional amendment to lower the voting age to 18 was supported by even conservative Senator Barry Goldwater who David Brinkley for NBC reported extolled the virtues of young voters. The right of citizens of the United States, who are 18 years of age or older, to vote shall not be denied or abridged by the United States or by any state on account of age. Repeat that word out of the Constitution -- or abridged. Now that right is at risk now in North Carolina. In recent years, we have done a lot of stories about voter disenfranchise including voters in North Carolina including gimmicks like shortening early voting periods and eliminating same day registration. Well now young voters of North Carolina are join forces with groups like the NAACP and the ACLU to protect their rights, particularly, for young voters. Look at these restrictions. In 2016, voters down there in North Carolina will need to show photo ID. Student ID cards, even from state universities, like Chapel Hill, will not be acceptable. And the North Carolina law eliminates a program where teens who preregister to vote when they reach 16 or 17 are automatically registered to vote when they get to be18. Young voters and civil rights groups have brought a lawsuit against the state of North Carolina. And today a hearing, today, will be held on whether to delay the North Carolina voter law until a judge decides whether or not it's constitutional. Bryan Perlmutter’s the director of Ignite NC, a youth organization focused on voting rights in North Carolina, he graduated from NC State last year. Also joining me is Denise Lieberman, senior attorney at the advancement project who’s representing plaintiffs in the case against North Carolina. Denise, give me the info. What are they up to down there? Just give me the raw politics. Why are they trying to stop young people, 18-21, young adults, from voting? DENISE LIEBERMAN: Thank you. Today the plaintiffs went to Court to seek an injunction to block the provisions of North Carolina’s voter suppression law that seeks to affect a broad swath of voters in North Carolina. Young voters, voters of color through the provisions including the voter ID provision that blocks student identification but a wide range of other provisions as well that hampers and abridges the right to vote at every step of the voting process from are the registration table to the voting booth to having those votes counted. This law abridges the right to vote by eliminating same day registration, by eliminating successful preregistration programs for 16 and 17-year-olds that were found to have a disparate use by young voters of color to get them engaged in the voting process. This law also eliminates a week out of the early voting period and numerous other provisions that the state does not dispute have been more widely used by voters of color and have been largely responsible for expanding access their access to the voting booth. MATTHEWS: Bryan, talk about this from your age group. You're 23 years old. Tell me about what this means to you, what this new law has meant to you and your classmates, your peer group. BRYAN PERLMUTTER: Yeah and I think it’s really important to understand to see just how many people this new law will affect and how much important an injunction is. So there is a report by Democracy North Carolina that published in 2012. 150,000 people over 150,000 16 and 17-year-olds used the provision that allowed them to preregister when they were 16 and 17 years old. And during early voting in 2012 when we had same day registration, 42% of people that used same day registration were under the age of 30. And so not only have we eliminated same day registration and eliminated making it preregistration for 16, 17-year-olds, right, would these provisions be gone? It's clearly intentional that the new law is going disenfranchise young people. MATTHEWS: Why is a student ID card considered not reliable? Say you go to Chapel Hill or NC State. If you have a student ID card, that’s good enough, why isn't that good enough for voting? LIEBERMAN: That's exactly the point. There is absolutely no reason that it's legitimate, that is nondiscriminatory, that has been proffered by the states for why these restrictions exist. Other than the obvious conclusion that the legislature knew the impact would be to harm young voters and particularly young voters of color. And that's the intent they have. MATTHEWS: Why is a gun license good, but not a UNC student license. Why is a gun license good, not a UNC student student card? Who would have a gun license? You mean they assume right-wingers have guns. Denise? LIEBERMAN: That's right. These are cards. There is no explanation. And that's exactly the argument we’ve raised in court today. That the state offered no explanation except voters need confidence in the process. It seems when we restrict measures shown to be successful at expanding access to the vote for groups that have been traditionally left out of the vote that it doesn't increase confidence in the voting process. That, decreases it. And you have a a great example with the student ID cards issued by the state of Nebraska. What possible reason could there be that the cards were less reliable than other cards? But the broader point is there is no evidence that this identification is necessary at all. The legislature had no evidence before it that voter fraud was a problem. The legislature knew this. And what they also knew that young voters and voters of color were far more like already to lack one of the forms of ID. That they included on their narrow are list. MATTHEWS: Well, restrictive voting laws, we’re talking about all across the country, right now North Carolina, appear to be solving a problem that doesn’t exist. And this is a point that has to be made. Republicans are making it too. A Republican lawmaker was quoted in the New York Times. Catch this. Jeff Tarte, a Republican state senator down there who supported the voter ID laws said lawmakers did not intend to keep younger voters away from the polls. He said they were trying to keep “students are from submitting absentee ballots in their home states and also voting in North Carolina. ‘Not that they would necessarily do it but why offer the possibility.’ Now Brian, to you. I'm trying to think of what weird person would risk a felony charge by voting in say North Carolina when they are from Virginia, voting in both states, even though it hasn't happened yet. And that's their excuse for why you can't use a Virginia driver's license if you're, basically enrolled at Chapel Hill or NC State for four years and are voting down there. PERLMUTTER: It seems like every week it seem there is a new reason or something falls out of the sky for passing this new law, and it’s ridiculous. There is no evidence, no precedent. Students and young people and people of color need to be able to access the ballot boxes as one of the pillars of democracy and a way to express their voice. And these measures are just ridiculous and are making it harder for young people to vote, they’re making it harder for people of color to vote. And it's intentional. And, you know, there is a legal battle going on now that's so important to the case. And there’s also folks all over the state that are passing out wallet cards from Democracy North Carolina and giving people access and information to the ballot box. But this law is absurd. MATTHEWS: Just to remind everybody. For the constitutionalists out there on the right, center and left, we’re all constitutionalists this is the 26th amendment again. The right of citizens of the United States who are 18 years of age or older to vote shall not be denied or abridged by the United States or by any state on account of age. Couldn't be clearer. Strict construction. Let these young people vote. Thank you, Brian Perlmutter and thank you Denis Lieberman. You are on the right side of history.